An old Games Domain review says it all about this underrated strategic flight simulation:"Achtung Spitfire (AS) is billed as the "prequel" to Over the Reich (OtR) since it covers the time period from 1939-1943, which immediately precedes the time period of OtR. The games share the same interface and flight engine, though, so anyone who owns OtR will feel immediately at home. 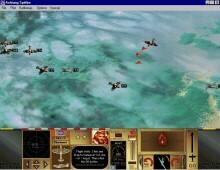 The game includes the R.A.F., the Luftwaffe, and the French Armee de l'Air, with campaign games for all three. here are numerous scenarios, and one can always design more using the scenario builder function. At first glance, it would seem that this is the perfect companion to OtR, and the above features -- as well as the ability (after installing the v1.13 patch) to transfer pilots from AS to OtR in 1943 and continue a Tour of Duty that can encompass the entire war -- mean that if you own and enjoy OtR, you should stop reading right here, get up, and buy the game right now (if you haven't already). Achtung Spitfire has one tremendous advantage going for it that Over the Reich does not, though, and it is probably solely due to this factor that AS is, in my opinion, the better game. Both games sink or swim on the basis of their campaign games, since single-scenario dogfights that provide no sense of continuity are of limited interest.. It is difficult to say where I stand on this game. The flight modeling is unquestionably impressive, but the fact that players are given no information about how the game goes about resolving the machanics of movement and combat is so egregious that even though the game has several strong points, the lack of a manual detracts greatly from the good features of the game. As I stated above, the 1939-43 campaign game suffers from a lack of flexibility and a general sense of historical irrelevance. Players who simply like the idea of guiding a group of pilots through mission after mission will appreciate the ability to connect the 1939-43 campaign to the 1943-45 campaign in Over the Reich. I like a more interactive environment, and I would have preferred that the campaign engine had been expanded. As it stands, I still find myself dragging the game out regularly, but only to play single dogfights, and I tire of these fairly quickly. Although it takes a fair run at it, Achtung Spitfire is not a truly effective turn-based air combat game. What makes me sad is that I'm afraid that this is the closest we'll ever get. In this case, I'd have to stick with cardboard counters. Avalon Hill and Big Time Software are apparently planning a third game in the series, Whistling Death, to cover the air war in the Pacific. Maybe next time they can get it completely right."